Post summary: How to do complete email verification with your own Automation SMTP server. SMTP is protocol initially defined in 1982 and is still used nowadays. In order to automate application which sends out emails, you need SMTP server which reads messages and saves them to disk for further processing. Note that this is only in the case when your application sends emails. One option is to use SMTP server provided by Windows. Problems here are two. First is that from Vista SMTP server is no more supported. There is SMTP server in Windows Server distributions but the license for them is more expensive. The second problem comes from the configuration of the server. You might have several machines and configurations should be maintained on all of them. It is a feasible option to use Windows SMTP server but the current post is not dedicated to it. What I offer in this post is your own Automation SMTP Server. It is located in following GitHub project. The solution is actually a mixture of two open source projects. For the server, I use Antix SMTP Server For Developers, which is really good SMTP server. It is windows application and is more suitable for manual SMTP testing rather than automation. I’ve extracted the SMTP core with some modifications as a console application which saves emails as EML file on disk. For the reading of emails, I use the source code of Easily Retrieve Email Information from .EML Files article with several modifications. What you need to do in order to make successful email verification is download executable from GitHub and follow instructions below. More info for it can be found on its homepage Automation SMTP Server. In GitHub AutomationSMTPServer repository there is an example that shows how to use Automation SMTP Server. The server should be added as a reference to your automation project. Since it is a reference it gets copied into compiled executables folder. Before doing anything in your tests it is good to delete old emails. Automation SMTP Server is saving mail into a folder named “temp”. This is how it works and cannot be changed. The server is a console application. It receives emails and saves them to disk. If counterparty sends a QUIT message to disconnect server gets restarted to wait for next connection. The server should be started as a process. Port should be provided as arguments. If not provided it can be configured in SMTP Server config file. If not configured there it gives a message and takes 25 for default port. This is the point where your application under test is sending emails which you will later verify. Once emails have been sent out from the application under test you are ready to read and process them. Here you can use EMLFile class which is parsing the EML file and is representing is an object so you can do operations on it. Once you have the mail as an object you can access all its attributes and verify some of them. It all depends on your testing strategy. Another option is to define on expected EML file, read it and compare both actual and expected. EMLFile class has predefined Equals method which is comparing all the attributes of the emails. This part is important. If not stopped server will continue to work and will block the port. Its architecture is defined in such manner that only way to stop it is it to terminate console application. In a case where you have started it from C# code as process way to stop it is to kill the process. Proper email verification can be a challenge. In case your application under tests send emails I would say it is crucial to have correct email testing as mail is what customers receive. And in the end, it is all about customers! So give it a try and enjoy this easy way of email verification. Post summary: How to extract text from PDF in C#. PDF verification is pretty rare case in automation testing. Still it could happen. iTextSharp is a library that allows you to manipulate PDF files. We need very small of this library. It has build in reader that iterates through pages and returns only text. Once extracted text can be verified against expected as described in Text verification post. Post summary: Verify actual text with expected one by ignoring what is not relevant during compare. In automation testing, there is no definitive way what text verification is best to be done. One strategy is to check that an expected word or a phrase exists in actual text shown in the application under test. Another strategy is to prepare a large amount of text to verify. Later strategy is expensive in case of effort for preparation and maintenance. The first strategy might not be sufficient to do correct verifications. What I suggest here is something in between. Not too much but not too less. Problem with a paragraph of text to be verified is it might contain data we do not have control over, e.g. date, time, unique values, etc. Imagine an e-commerce website. When you place the order there is order confirmation page. You want to verify not only that you are on this page but also that text is correct as per specification. Most likely text will contain data you do not have control over – order number and date. Breaking verification is small chunks is an option. Another option is to manipulate the actual text. The third option is to define the text as expected with special strings that will get ignored during compare. And then you can compare both where ~SKIP~ will be ignored during compare. It might take little bit more effort to prepare expected strings but verification will be more accurate and correct rather than just to expect a word or a phrase. Post summary: What is dependency property in .NET and how to read it from Telerik Testing Framework. In this post, I’ll show an advanced way of getting more details from an object and sophisticate your automation. This post is part of Advanced WPF desktop automation with Telerik Testing Framework and TestStack White series. The sample application can be found in GitHub SampleAppPlus repository. Dependency properties are an easy way to extend available in .NET framework functionality. In SampleAppPlus there is CustomControl defined. Purpose of this control is to store text and visualize this text as image. The text is stored in dependency property. In order to be able to properly automate something, you have to know the internal structure of the application. Generally, you will try to locate and read the element and it will not work in the ways you are used working with elements. At this point, you have to inspect the source code of application under test and see how it is done internally. Most important if dependency property is used you should know its name. Once you know the name reading is easy. GetAttachedProperty is a powerful method. Along with reading dependency properties, you can read much more. In some cases, WPF elements are nested in each other or in tooltip windows. In other cases, some object is bound to WPF element. In such situations you can try to access the elements and method will return you FrameworkElement object. From this object, you can again get GetAttachedProperty to access some class specific property. In all cases, you will need access to the application under test code to see how it is working internally. GetAttachedProperty is a powerful method. Once you get stuck with normal processing of elements you can always try it. I would say definitely give it a try. Post summary: re-use of page objects code through inheritance. Inheritance is one of the pillars of object-oriented programming. It is a way to re-use functionality of already existing objects. I’ve started a series with details of Advanced WPF desktop automation with Telerik Testing Framework and TestStack White. The sample application can be found in GitHub SampleAppPlus repository. An abstract class is one that cannot be instantiated. An abstract class may or may not have abstract methods. If one method is marked as abstract then its containing class should also be marked as abstract. We have two similar windows with text box, save and cancel button that is shown on both of them. AddEditText class following Page Objects pattern. It is marked as abstract thought. It has an implementation of all three elements except TextBox_Text. The only thing we have to do in Add Text window is to implement TextBox_Text property. All other functionality has already been implemented in AddEditText class. In Edit Text page object we have to implement “TextBox_Text” property. Also on this window, there is one more element which needs to be defined. Inheritance is a powerful tool. We as automation engineers should use it whenever possible. Post summary: Solution for automated testing of multilingual sites by using string values in all supported languages for enumerations. In efficiently use of enumerations with string values in C# post I’ve described how you can add text to an enumeration element and then use it. 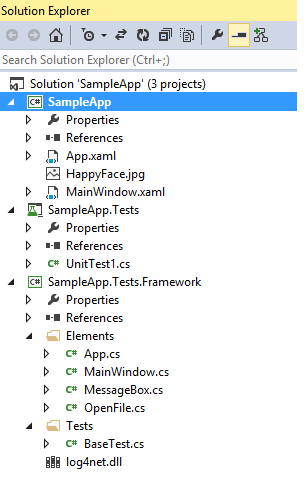 Current post is elaboration with code samples for testing multilingual applications. Multilingual automation is always a challenge. If you use text to locate elements or verify condition then trying to run a test with different language will fail. Enumerations with language dependent string values is a pretty good solution. How to do it is described below. StringValue class is extending System.Attribute. It has two properties for text and language. It should have AllowMultiple = true in order to be applied as many times as many languages you have. With reflection read all StringValue attributes. Iterate them and return the one that matches language given as parameter. All supported languages can be defined as string constants. It will be pretty cool if can define an enumeration with languages and pass it in the StringValue constructor as a language but it is not possible as it is not a compile-time constant. Somewhere at a top level of your tests, you should have property or field which most likely will be read from conflagration and will define for which locale is the current test run. This is then used to read correct text value for given enumeration element. Multilingual testing is a challenge. Be smart and use all tricks you might get. In this post, I’ve revealed pretty good trick to do the automation. Challenge with this approach will be initially set up of enumerations with all the translations. Post summary: Using enumerations or specialized classes makes your automation tests easy to understand and maintain. Show with code samples how to define and read string value to enumeration elements. When you do automation tests and have to pass a value to a method it is so easy and natural to just use strings. There are many cases where a string is a correct solution. There are also many cases where a string can be a solution, but enumeration or specialized class are better and more efficient solution. Having the following example – web application with drop down which has several options. We are using Page objects pattern to model the page. Page object has a method which accepts the option to be selected. String seems like a natural solution but is wrong. Although string will work enumeration is the only right solution. Drop down has limited and already defined options that can be selected. Exposing just string may cause misinterpretations for the consumer of your method. It is much more easy to limit the consumer to several enumeration values. In this way, consumer knows what data to provide and this automatically keeps code clean from magic strings. If changes are needed they will be done only in the enumeration making code easier to maintain. Using enumerations for example given above will not work. Unlike Java enumerations in C# are wrappers for int or other numeric types value. You are not able to use text with enumeration element. Only way to use string values in enumerations is by adding it as an attribute to each enumeration’s element. It takes several steps in order to accomplish this. Below are code samples how to use string values with enumerations in C#. Defining and reading of the attribute is functionality built in NTestsRunner. The first step is to create a class that extends System. Attribute. It has only one string property to hold the text in it. The text is passed in the constructor. Note that this class is defined in System namespace in order to have it by default skipping the need of importing namespace you might not be aware of. C# provides so-called extension methods, a great way to add new functionality to the existing type without creating new derived type. Reading of string value from enumeration element is done with a GetStringValue extension method. With reflection, all StringValue custom attributes of an element are obtained. If some found text of first is returned. If not then string representation of the element is returned. Once StringValue class is ready it can be applied as an attribute to any enumeration. In code string value can be obtained from enumeration’s element with a GetStringValue method. Using enumerations is mandatory to make readable and maintainable automation. Working effectively with enumerations will increase your value as automation specialist. Post summary: NTestsRunner implementation details and features. In the previous post I’ve described unit testing frameworks and why they are not suitable for running functional automated tests. I introduced NTestsRunner – very simple runner that can be used for running your automation tests. This topic is dedicated to implementation details of the NTestsRunner. It is important in functional testing to be able to place several verification points in one test. For this purpose, abstract class Verification is implemented. It has two properties to store more details about verification and time it was taken. Constructor receives comma separated string values. In case of zero strings are passed then the result is an empty string. If one string is passed then this is the result. If more than one string is added then first string is taken as formatting string and others are used to build up the result. Logic is similar to string.Format(String, Object) method. Test case is generally a set of conditions to verify whether given scenario works are per user requirements. In automation, world test case is test method with several verification points inside. In NTestsRunner TestCaseResult is class representing the idea of a test case. It has properties for name, time to run and list of all verifications with a count of passed and failed. TestPlanResult in NTestsRunner has nothing to do with test plan term from QA world. Here this is a representation of a test class with test methods inside. It has properties for name and time to run. Also, there is a list of all TestCaseResults, i.e. test methods in that class. There are counters for passed and failed test cases and also counters for all passed and failed verifications inside all TestCaseResults. In order to make one class a test class, it should have with [TestClass] attributes. To convert method to a test one it should have [TestMethod] attribute. Just the attribute is not enough though. The method should have special method signature. This is required by NTestsRunner. Method to receive parameter List verifications in its signature, i.e. Configurations can be found on NTestRunner home page. Once object from NTestsRunner is instantiated and configured tests with Execute() method. Inside this method, all classes from calling assembly (the one that holds the tests) are taken. If TestsToExecute is configured then only those with name matching is given values are taken. If no TestsToExecute is provided then all classes with the attribute [TestClass] are taken. Methods from each class are taken by default in order of appearance in the class. If the method has [TestClass] attribute then the method is executed by passing List object to it. Inside the method, Verifications are collected as a list into a TestCaseResult object. After the method is run TestCaseResult is added to its parent TestPlanResult which is added to list with all results. In the end, results are saved as XML and HTML. In order to integrate with CI tools such as Jenkins or Bamboo results are exported to XML file after execution has finished. The file is named Results.xml and is located in test results folder. XML format is implemented according to junit-4.xsd. Tests result are saved as HTML report for better readability. The file is named Results.html and is located in test results folder. 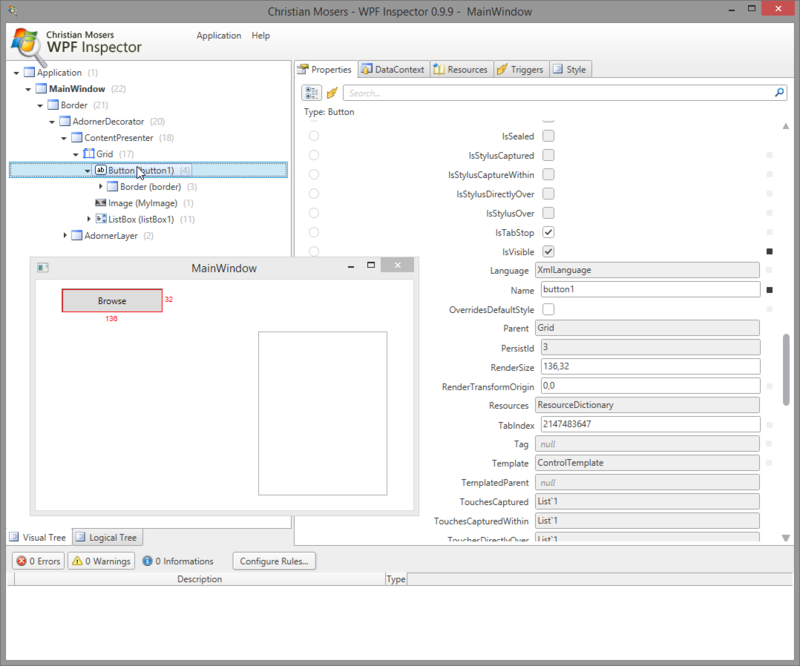 In order to use NTestsRunner a console application project is needed. This project will hold test classes. As the one below. Take into consideration that this is very simplified usage pattern. In reality, Page objects design pattern will be used. Page objects will make the verifications and return them. In its main method, a new instance of NTestsRunner is created. Configurations are done and test executions are started. It is that simple to use it. NTestsRunner has its pros and cons. This is a pretty good tool for running functional automated tests. It is very easy to use and is made especially for running functional automated tests. You can definitely give it a try. .Post summary: Unit testing frameworks are not very suitable for running functional tests. NTestsRunner is an alternative way of running functional automated tests. Unit testing is focused on testing of code on a low level. Methods, sets of methods or modules are being tested by writing test code which invokes those methods with specific arguments. In unit testing, all external dependencies (database, file system, network, etc.) are removed. Those resources are simulated in unit tests by using so-called mock objects. Mock objects are controlled by tests designer and have predictive behavior. Running a piece of code which doesn’t have external dependencies happens almost immediately. So unit tests are executed for a very low amount of time. It is considered a set of unit tests taking longer than 5 minutes is not well designed. Unit tests are strictly focused. One test tests only one condition. Each test is not related in anyhow to other tests. Unit testing frameworks conform to unit tests purpose and design. Tests should not depend on each other. For this reason, unit testing frameworks execute tests in random order (xUnit.net or MS Unit Testing Framework), other like NUnit in alphabetic order of tests method names. Checking for given conditions are done with assertions. If one assert fails current test execution is stopped and the test is marked as failed. Functional testing is focused on ensuring that software product works as per user requirements. Real life software has external dependencies. Most software products have some kind of user interface. Automation tests are focused on verifying that UI works correctly. Transferring and rendering data to UI takes time, database operations take time, file and network operations also take time, etc. In general functional tests are more complex and take much longer to execute. In order to be efficient checking of several conditions are defined in each test. Functional tests can be manual and automated. In current post when I mention functional tests I mean only automated. In a perfect situation, a functional one test should verify only one condition. In reality, because of too many external dependencies, time for tests execution is large. A time matters. In order to shorten this time we make several checks in one test. For e.g. in an e-commerce website, an order is placed. We verify order confirmation page that there is order number, that address is same used during checkout, that user’s email is correct. We also can verify inside user’s email box that received mail is correct. We can check in a database for some properties of the order. If we have to do one order for each check tests will take significantly longer time. To be efficient we do all checks with one order in one test case. We need a framework which allows you to have multiple verifications in one test. Furthermore, if verification is failed test execution should continue. What is really good to be avoided but sometimes cannot is test dependency. Sometimes one test needs another to have done something before continuing. As I said this should be avoided but in order to be efficient you should make a trade-off between good tests design and time to execute. For e.g. you may want to cancel and then refund order placed in an e-commerce website. Generally, it is best to place a new order for this test but if the placing of order requires too much time then an option is to reuse already existing order from the previous test. We need to be able to control test case execution order. In order to have control over tests and use many verifications, I’ve created NTestsRunner. Its code is in GitHub NTestsRunner repository. This is a .NET library. You create a console application with your tests and use the library within. Tests are annotated is similar fashion as with unit testing frameworks. Tests are executed in sequential order. There could be many verifications. Results are saved as HTML and XML in JUnit format. NTestsRunner is described in more details in NTestsRunner for functional automated tests post. Post summary: Guide how to locate WPF elements with Telerik Testing Framework. 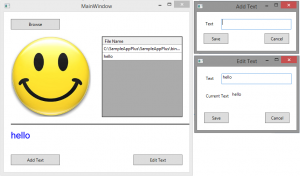 MainWindow.cs class is a representation of the main window of our sample application which is WPF. Note that code here is shortened. The full code can be found in GitHub repository. MainWindow is following Page Object design pattern. Elements are private Properties. Actions on elements are public methods that are the actual building blocks of the tests. Do not just add action methods for the sake of adding them. Add them if only the tests need such action. If the element is used in only one action then it could be inside the action method, but if the element is used more than one it is mandatory to keep it as separate property. The main idea is to avoid duplications in order to improve maintainability. Remember to stay DRY: one element must be defined in only one place. This is the strategy used by the Test Studio generated tests and I prefer it. Another element structure could be not to extend XamlElementContainer but pass a VisualFind object through MainWindow’s constructor and use it internally to locate elements. How to locate elements is described in finding page elements article. As you can see I’m using exact XamlPath find expression in order to locate my elements because I find it consistent and easy to maintain. XamlPath syntax is pretty similar to XPath. The difference is its indexes are zero-based (Button is the first element) and it doesn’t provide predicates and axes. The hard part is to get the XamlPath. I have found this lovely tool WPF Inspector. 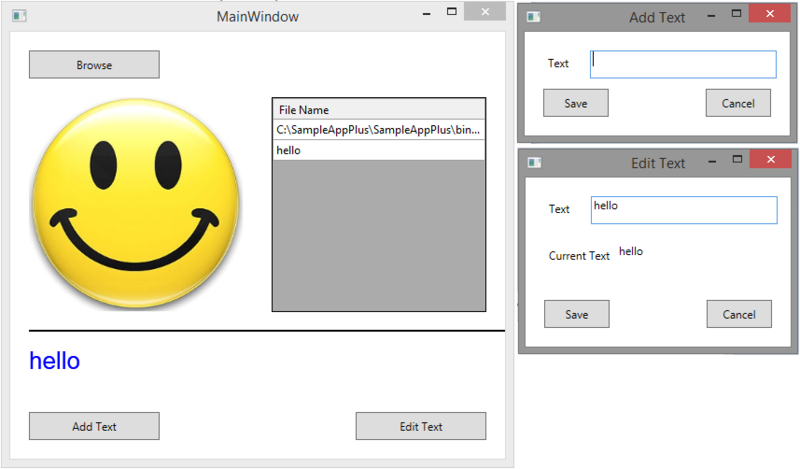 It gives a lot of information about the structure of WPF application. This is a screenshot of the XamlPath for Browse button. In more complex UIs even with this great tool, it is not that easy to get the XamlPath. If you find it hard you may consider other find expressions. All elements on MainWindow are only WPF thus an instance of White is not needed. In case of WinForms content hosted inside WPF, you can pass an instance of White through elements’ constructor and use it in actions inside. 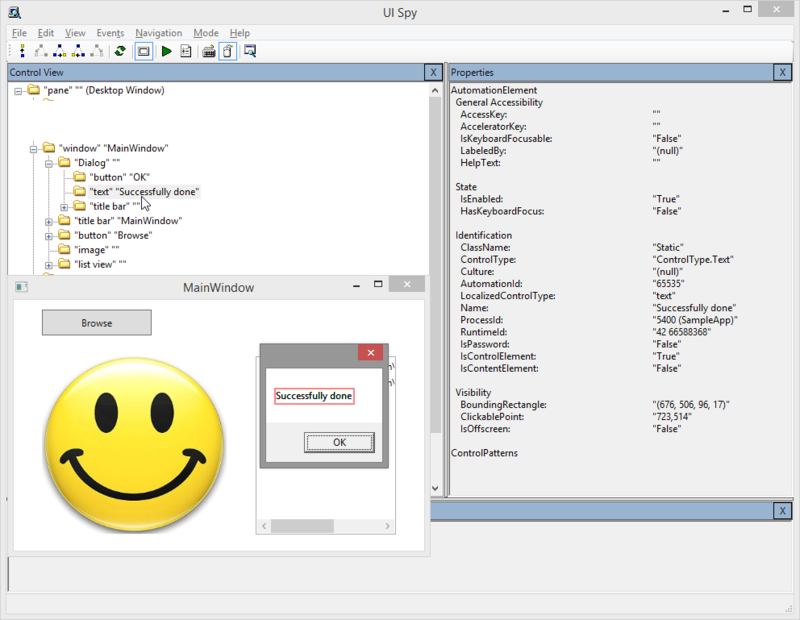 Having an instance of White inside the class you can work with it as explained in WPF automation – locating and structure of WinForms elements post. Post summary: Complete code example of how design patterns can be used in real life test automation. With series of posts, I’ve described 5 design patterns that each automation test engineer should know and use. I’ve started with a brief description of the patterns. Then I’ve explained in details with code snippets following patterns: Page objects, Facade, Factory, Singleton, Null object. Code examples are located in GitHub for C# and Java. This post is intended to bond all together in a complete guide how to do write better automation code. Generally, automation project consists of two parts. Automation framework project and tests project. Current guide is intended to describe how to build your automation testing framework. How to structure your tests is a different topic. Remember once having correctly designed framework then tests will be much more clean, maintainable and easy to write. To keep post shorter some of the code that is not essential for representing the idea is removed. The whole code is on GitHub. Everything starts by defining proper page objects. There is no fixed recipe for this. It all depends on the structure of application under test. The general rule is that repeating elements (header, footer, menu, widget, etc) are extracted as separate objects. The whole idea is to have one element defined in only one place (stay DRY)! Below is our HomePage object. What you can do generally is make search and clear search terms. Note that clearing is done with jQuery code. This is because of a bug I’ve described with a workaround in Selenium WebDriver cannot click UTF-8 icons post. WebDriver factory will be responsible for instantiating the WebDriver based on a condition which browser we want to run our tests with. The constructor takes an argument browser type. Browser type is defined as an enumeration. This is very important. Avoid passing back and forth strings. Always stick to enums or special purpose classes. This will save you time investigating bugs in your automation. This is null object pattern and implements IWebElement. There is a NULL property that is used to compare is given element is not found or no. WebDriver facade main responsibility is to define custom behavior on elements location. This gives you centralized control over elements location. The constructor takes browser type and uses the factory to create WebDriver instance which is used internally in the facade. FindElement method defines explicit wait. If the element is not found then NullWebElement which is actual implementation of Null object pattern. The idea is to safely locate elements with try/catch and then just use them skipping checks for null. As I mentioned initially this post is about using efficiently design patterns in your framework automation project. Tests design are not being discussed here. Once you have designed the framework one simple test (without asserts) that makes search will look like the code below. Design patterns are enabling you to write maintainable code. They increase the value of your code. As shown in this series of posts they are not so complicated and you can easily adopt them in your automation. Most important is design patterns increase your value as a professional. So make the time to learn them! Post summary: Description with code samples of Singleton and Null object design patterns. Singleton pattern is used in a case where you want to restrict the instantiation of a class to only one object. The class should not require parameters for its construction. If the creation of a class requires significant resources then a singleton is a suitable solution. It is good that singletons are created when they are first needed, so-called lazy initialization. This post is part of design patterns guide series. Code examples are located in GitHub for C# and Java. Null object implements given interface and its methods are doing nothing. This makes the null object more predictable. You can safely invoke methods on the null object without the threat of a NullRefferenceException to break your application. This pattern is very well combined with singleton pattern where a null object is actually a singleton. In this case, you can check for reference or equality. Most common usage of Singleton pattern is to limit WebDriver to only one object instance in the whole automation test project. I’m going to give slightly different usage example where Singleton is used along with Null object pattern. NullWebElement implements IWebElement interface so it must implement all methods and properties defined by the interface. This is done on lines 4 to 21. Properties are returning some values, but not null! Methods are doing nothing. From line 23 to 36 is the Singleton definition. If Singleton is an object you have defined then it should have a private constructor so no one is able to instantiate it. There is a private field which actually holds the reference to the singleton. NULL is a property which instantiates the singleton if not already instantiated and returns it. There are two main benefits of code above. The first benefit comes from the Null object pattern. You can locate an element which doesn’t exist and call some of its methods without your tests to crash. You might say that comparing for null is not a big overhead, but in big having a null check before each action is a waste of time. It might be a discussion whether it is better to silent this failure error with a null object or leave to a massive crash. My opinion is you must fail the test and if you put some logging into Click method of the NullWebElement then you can easily trace the issue. The real benefit is you will have only one failed test instead of the whole bunch failed because of the crash. The second benefit comes from the Singleton pattern. You can easily compare some element against the NullWebElement.NULL. Most likely you will locate the element and use it safely because of null object pattern, but there might a case where you want to see if the element is actually not found. Singleton is a pattern that you definitely should know. A null object with a combination of Singleton can decrease the amount of code you write by skipping the checks for null. I would say if adopted those can simplify your code which is a benefit in big projects.